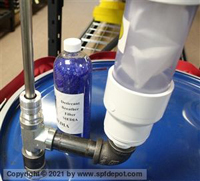 Maintain the correct temperature of plural spray foam components with PMC-USA/Polymac spray foam heated hose. Ideal for high-pressure and large jobs, this 3500 psi x 50’ heated SPF hose is a top seller with our spray foam insulation, roofing and spray-on truck liner customers. A quality high- pressure heated hose not only feeds the spray gun but also results in better foam and polyurea application. 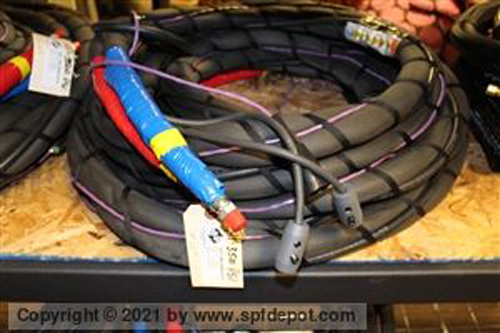 This heated hose with thermocouple wire is compatible with PMC-USA/Polymac spray guns. Scuff Jacket NOT Included. 3/8" x 50' High Pressure- 3500PSI, Braided heater wire surrounds the hose and is encapsulated inside to prevent any moisture from contacting the heater braid. Heater braid provides an 85% coverage of the hose compared to 35% of the ribbon heater wire. PVC Protective Extruded Jacket, Heater and thermocouple wire, 3 pin connector, heater wire connecting block and fittings included. Scuff Jacket - Order 246077 Scuff Jacket. 50' lengths.